AT Ankertechniek B.V. develops and manufactures metal products for the precast/prefabricated concrete and building industry. Their range comprises all conceivable connections and systems for moving and connecting concrete parts. Quality, flexibility and quick delivery times are highly valued at AT Ankertechniek B.V. The engineering department, the production location with an extensive range of machinery and warehouse capacity are located in Montfoort, in the Utrecht region of the Netherlands. From here, the metal products are delivered directly from stock. With their knowledge and facilities, AT Ankertechniek B.V. is able to offer specific, customer-oriented solutions. Solutions that can realize the innovative and efficient constructions of the building and precast/prefabricated concrete industry. 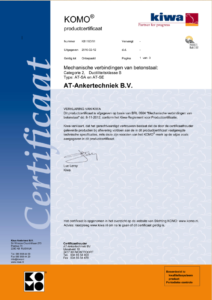 The products of AT Ankertechniek B.V. are interchangeable with virtually all competing products in the market. Customer focus, service, quality assurance and the extensive product range for many construction and concrete companies are the reasons to choose AT Ankertechniek B.V.